*Department of Management Sciences, COMSATS Institute of Information Technology, Islamabad, Pakistan. ** Faculty of Management Sciences, International Islamic University, Islamabad, Pakistan. ***Hailey College of Commerce, University of the Punjab, Lahore, Pakistan. ****Corresponding Author, Faculty of Management Sciences, International Islamic University, Islamabad, Pakistan. Received: June 22, 2013. Revised: October 20, 2013. Accepted: January 16, 2014. Purpose - This study examines the relationship between organizationaljustice and employee job satisfaction and the extentof its moderation by perceived alternative job opportunities. Research design, data, methodology - This is across-sectional study utilizing survey questionnaire data from 220bank employees, which included scales measuring organizationaljustice, job satisfaction, and perceived alternative jobopportunities. Results - The data is analyzed using correlation and hierarchicalregression. Results demonstrated that organizational justicehas a direct positive impact on employee job satisfactionfurther, distributive justice explains more variance in job satisfaction,followed by procedural justice and interactive justice.Perceived alternative job opportunities moderate the relationshipbetween organizational justice and job satisfaction. Conclusions - Generally, organizational justice increases bankemployees’ job satisfaction; however, when they perceived morejob opportunities, their job dissatisfaction increased notwithstandingfairness. Therefore, perceived job opportunities moderate therelationship between organizational justice and job satisfaction.Retaining skilled employees has become difficult, especiallywhen there is market demand for skilled workers. Human resource(HR) managers should consider market situations beforeformulating policies; otherwise, they may lose the competitiveadvantage of skilled employees and workers. JEL Classifications : A10, A13. Key Words : Organizational Justice, Jobs Satisfaction, Perceived Alternative Job Opportunity, Bank Employee, Pakistan. Employee job satisfaction has always been a focus of human resource managers and researchers. Satisfaction is a form of attitude and it is a multi-dimensional construct. So it has been linked with different antecedents and consequences. Job satisfaction brings a lot of desirable outcomes, such as: commitment, performance, OCB. It also decreases some undesirable outcomes like: absenteeism, turnover and organizational deviance etc. Attention should be given to the employee Job satisfaction, which is necessary for retaining and attracting well-qualified personnel. Organizational justice and fair treatment have been tremendously reported as a major predictor of employee job satisfaction (McFarlin and Sweeney, 1992). Justice issues are the key concerns in main-stream journals of individual and organizational psychology. Topics of justice and fairness are found in the domain of philosophy. Discussion on these topics has been taking place since the time of Plato and Socrates (Colquitt et al.,2001). Research on organizational justice has gained attention of researchers in last three decades because of its desired outcomes (Ambrose, 2002). Social exchange theory coined by Adams (1966) has provided possible conceptual grounds for understanding relationships between employees and their work organizations (Eisenberger et al., 1997). Issues of justice or fair treatment have been a key concern, particularly for employee job satisfaction. In work places employees often estimate whether the reward they receive match their contributions to the organization or not (Judge and Colquitt, 2004). Due to increase in globalization, the importance of smart management is realized. Selection, recruitment and then retention of human resource and human capital are gaining more attention of human resource managers across the world. More availability of alternative jobs has increased employee awareness and their expectations by multiples. Due to more availability of alternative job opportunities, employees are not going to agree on anything less what they expect and what is being offered them from competitors. The competitive edge of any organization can easily be lost if the employees decide to explore the opportunities outside the organization. On the other hand, more availability of alternative employment opportunities changes employee attitude towards his current employment status (Gerhart, 1990; Hulin et al., 1985). The most theoretical model which has focused on perceived alternative job opportunities, have theorized that availability of alternative jobs in abundance is likely to create dissatisfaction with current employment (see Hulin et al., 1985; Mobley, 1977; Price, 1977). So far, most of the studies on perceived alternative job opportunity have specifically focused on turnover intention or actual turnover. These relationships are very important in work and organizational psychology and have important implications for both employees and organizations. Organizations are always interested in retaining a healthy team of satisfied and productive employees; so that, they may achieve the competitive advantage. HR managers, researchers and practitioners are keen to know that what would be the internal and external factors which may reduce the satisfaction level of their employees. This research will highlight some important factors that influence employees’ satisfaction and their willingness to work for employers. Therefore, paying attention to justice seems important because it enhances job satisfaction, which is associated with a number of desired outcomes. Separate studies have been undertaken, which examined the impact of organizational justice and perceived alternative job opportunity on employee job satisfaction. We are preliminary interested to see the combined effect of both variables on overall employee job satisfaction. To the best of our knowledge, no empirical study has examined the moderating effect of perceived alternative job opportunities on the relationship of organizational justice and employee job satisfaction. The aim of study is to cover this void in the literature by theorizing and empirically testing the moderating impact of perceived alternative job opportunities between the relationship of organizational justice and job satisfaction. The succeeding section of this article reviews existing literature on organizational justice, employee job satisfaction and perceived alternative job opportunity. Hypotheses are also presented based on presented literature. This section presents the brief literature review on the variable of the study, which leads to the development of research hypotheses. It begins with organizational justice and its relationship with employee job satisfaction. Then examines how perceived alternative job opportunities moderate the relationship between organizational justice and job satisfaction. Organizational justice refers to employee's perceptions, whether their organization treats them fairly or not (Greenberg, 1987). Organizational justice has been found a very important factor for the benefits of both employer and employees. It is most crucial for enhancing the motivation and satisfaction of employees. Attitude and behaviors of employees are strongly influenced by organizational justice. It forms their perception about fairness (James, 1993). The dimensions of organizational justice have been used widely as independent variables for many organizational and individual's desirable outcomes (Folger and Konovsky, 1989; Greenberg, 1990; McFarlin and Sweeney, 1992; Sweeney and McFarlin, 1993). The construct of organizational justice is complex it is not a one-dimensional construct. A review of justice literature has revealed that initially organizational Justice was theorized in four dimensions: distributive justice, procedural justice, interactional justice and informational justice (Colquitt, 2001). There was a high inter correlation between interactional justice and informational justice so informational justice was merged in interactional justice (Mansour-Cole and Scott, 1998). These three constructs of organizational justice are strongly related but these yield somehow different outcomes, i.e., performance, OCB and counterproductive behaviors (Cohen-Charash and Spector, 2001; Kernan and Hanges, 2002). This three-factor structure justice measure explained more variance and it possesses considerably improved psychometric properties than a global and other proposed construct of organizational justice (Liljegren and Ekberg, 2009). The three-dimensional model of organizational justice was very rigorously defined by Bies (2001). It is thus important to explain organizational justice constructs that include: distributive, procedural and interactional organizational justice. Initially, when researchers begun to address the issues of justice they focused only on distributive justice, distributive justice is the outcome or end which an employee finally receives as a consideration for his/her inputs and efforts (Deutsch, 1975; Gilliland, 1994; Leventhal, 1976). It can be called perceived fairness of outcome. From the distributive justice standpoint, employees estimate fairness of distributions of reward with respect to some precise set of distributive criteria, most probably with the equity criteria. The equity criterion simply states that the outcome will be faire if employee receives rewards according to his/her inputs and contribution to the organization (Greenberg, 1990). As the prime focus of distributive justice is with individual rewards, so it is considered to be related with cognitive, affective and behavioral reaction of individual for a particular outcome. Thus, when a particular outcome is perceived to be fair or unfair, in either case it will certainly affect the person’s emotions in terms of satisfaction, dissatisfaction, anger, happiness, pride, or guilt (Weiss et al., 1999). Procedural justice refers to the free and transparent methods and procedures used for the evaluation of employee outcomes in forms of reward or increment. It is also referred as perceived fairness of the process elements. It determines whether or not process of evaluation for individual reward is fare (Cropanzanoet al., 2001). Initially only distributive justice was the focus of researchers later on it was realized that only the perceived fairness of outcomes is not the only indicator of the fair treatment. So attention was shifted towards, the perceived fairness of the process by which the outcomes are estimated. it is also an important factor which determine organizational justice, in some cases it is rather more important determinant of perceived organizational justice than the distributive justice (Lind and Tyler, 1988). The procedural justice represents the way through which organization decides to distribute the rewards among its employees. The procedural justice is likely to affect cognitive, affective and behavioral reactions towards the organization, like organizational commitment (Martin and Bennett, 1996). When employees perceive the processes through which their rewards are being estimated are quiet unfair, in such case employees react against their organization rather than their personal job or assignment (Cohen-Charash and Spector, 2001). A lot of research has been conducted on organizational justice, particularly researchers were more concerned with distributive justice and procedural justice (Elanain, 2010). Distributive and procedural justices are both distinctive constructs and their differentiations are well defined in literature and empirically tested in a number of studies (See Colquitt, 2001). A third form of justice, interactional justice was suggested by (Bies and Shapiro, 1987). It was basically an extended dimension of procedural justice. Interactional justice covers human and interpersonal aspects of justice. In an organization the management or employers behave towards employees in controlling and allocating rewards describes interactional justice. Because it was closely related with procedural justice so some authors proposed that it is a social aspect of procedural justice and it is not a separate and independent dimension of justice (Cropanzano and Greenberg, 1997). Interactional justice is determined with respect to attitude and behavior of supervisor and managers with employees. Interactional justice is considered to be related to cognitive, affective, and behavioral reactions toward these representatives, that is, the direct supervisor or concerned authority who is supposed to deal with justice (Weiss et al., 1999). All dimensions of organizational justice are found to be meta-analytically related to a variety of desirable outcomes, attitudes and behaviours i.e., satisfaction, commitment (Colquitt et al., 2001) satisfaction with pay received (Moorman, 1991; Tang and Sarsfield-Baldwin, 1996) it effects employee work attitude (Folger and Konovsky, 1989). It further reduces absenteeism (Vallen, 1993); unethical behaviour among employees (Treviño and Weaver, 2001); propensity to search for another job, turnover intention and their actual turnover (DeConinck and Stilwell, 2004). Job satisfaction mediates the relationship between organizational justice and various individual and organizational outcomes (Elanain, 2010). Many researchers have found a positive link between organizational justice and job satisfaction (Irving et al., 2005; Zainalipour et al., 2010). The feelings of injustice are linked with dissatisfaction (DeConinck and Stilwell, 2004). Employee dissatisfaction causes many serious problems which reduces organization productivity. Dissatisfied employees engage themselves in counter-productive behaviors like less focus on work, stealing, poor service, negative rumors and sabotage of equipment (Syptak et al., 1999). (Locke, 1969) designed a model of dissatisfaction by anchoring it with equity theory, he found that an employee will be satisfied or dissatisfied with his/her job after making a psychological comparison. Equity theory explains employee job satisfaction via motivation (Greenberg, 1990). Review of organizational justice shows that distributive justice more strongly predicts particular personal outcomes such as, (job satisfaction and satisfaction with pay received) better than general organizational outcomes such as organizational commitment and OCB, procedural and interactional justice has more predictive power to explain general organizational outcome (Nadiri and Tanova, 2010). Job satisfaction is usually defined as a positive emotional state attitude or reaction towards the job situation. It is an important motivator for employee performance (Babin and Boles, 1996; Campion, 1991). (Cohen-Charash and Spector, 2001) conducted a meta-analysis by taking a sample of 190 studies, there were total 64,757 participants. They examined the outcomes of distributive, procedural and interactional justice. Their study revealed that distributive, procedural and interactional justice impacts differently on employee behaviours and organizational outcomes. Distributive justice more strongly affects the reactions regarding individual job conditions rather than the organization as a whole. Procedural and interactional justice brings supervisor commitment and organizational commitment which are concerned with the organization as whole. Distributive justice strongly correlates with job satisfaction and explain more variance in predicting employee job satisfaction than procedural or interactional justice (Nadiri and Tanova, 2010; Zainalipour et al., 2010). So we can propose that organizational justice will have direct and significant impact on job satisfaction and distributive justice will explain more variance in job satisfaction as compared to procedural justice. H1: Organizational justice will have direct positive impact on job satisfaction. H2: Distributive justice will explain more variance on employee job satisfaction as compared to the variance explained by procedural justice. (Mobley, 1977) theorized a model where he included some critical variables which assess the employee perception of alternative job opportunities and interaction with the external environment. Perceived alternative job opportunities have direct and indirect impact on intention to quit via job dissatisfaction (Griffeth and Hom, 1988). Perceptions and expectations of alternative job opportunities are also influenced by general labour market. Intention to stay in the organization is related to perceived alternative job opportunities and job satisfaction. When Employees perceives more alternative job opportunities and receive offers from other employers they make a comparison of cost and benefit between current and alternative jobs (Mobley, 1977; Price, 2001). An individual may find confidence or discouragement while searching a job, confidence or discouragement can be evaluated by certain events which imply success or failure in the job search; such as, numbers of job offers and frequency of interviews. Such factors influences the employee’s perceptions whether or not his search for job would ultimately be successful or not (Laker, 2011). When employees will perceive low alternative employment opportunities their job satisfaction will increase but when they will perceive high alternative employment opportunities their job satisfaction will decrease. Hence we can propose that perceive alternative employment opportunities are likely to moderate the relationship between organizational justice and job satisfaction. H3: Perceived alternative job opportunity is likely to moderate the effect of organizational justice on job satisfaction. Organizations which really want to retain and attract competent personals try to satisfy their workers by treating them very fairly in terms of distributive justice, procedural justice and interactional justice. Several studies have been conducted to find internal factors, which may affect employee job satisfaction with managerial implications, but even then there are some external factors, which are not under control of management, but it may reduce employee satisfaction with current employment. Focus should be given to these external factors, i.e., perceived alternative employment opportunity, which may affect employee job satisfaction. This study has been under taken for examining the moderating effect of PAJO between the relationship of organizational justice and job satisfaction. RQ1. Whether or not perceived distributive justice explains more variance on jobs satisfaction as compare to variance explained by procedural justice. RQ2. Whether or not perceive alternative job opportunities moderate the relationship between perceived organizational justice and job satisfaction. Participants were employees of commercial banks operating in Capital territory Islamabad. We chose banking industry based on purposive sampling, as the employees of commercial banks find more job opportunities as soon they gain some experience they feel no hesitation in changing their organizations if they feel that their organizations don’t treat them fairly. The list of potential pool of participants was obtained by utilising multi stage sampling. In first stage a comprehensive list of all bank branches operating in Islamabad was made. In second stage by utilising stratified random sampling we choose bank branches, strata were made on the basis of geographical location of branches. We made contact with branch managers of randomly chosen bank branches; informed them the purpose of study and got permission for conducting survey. However unit of analysis in our study are bank employees so in third stage 300 bank employees were randomly chosen from list of employees provided by bank, for taking their responses to test the hypothesis. A self-administered questionnaire with cover letter describing the purpose of study was hand distributed to 300 bank employees across different functional departments and from all levels of employees of bank. 230 respondents filled and returned these questionnaires nearly 10 questionnaires were excluded from final set of data for making analysis due to massive incomplete information or faulty responses. Hence 220 questionnaires were found useable from employees of 28 different commercial banks across public and private sector and conventional and Islamic banks, yielding a response rate of 73 percent. 71.4 percent respondents were males and 28.6 were females. Majority of the respondents were less than 35 years. 62.8 percent respondents were having qualification of bachelor or less and 37.3 percent were having master degree. Majority of the respondents were single 63.6 percent and 36.4 percent were married. 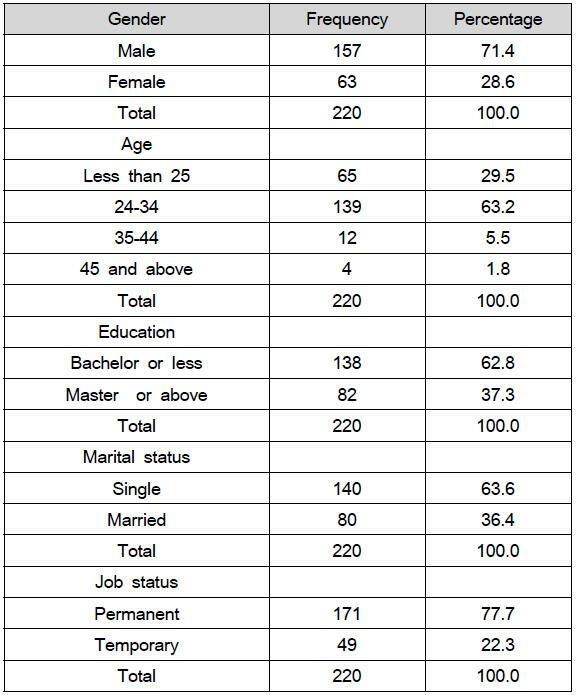 Most of the respondents were permanent employees 77.7 percent and 23.3 percent were temporary or ad hoc employees (see table 1 for details). Questionnaire was consisting of two sections. In first sections, there were some demographics variables i.e., gender, age, education, marital status and employment status. Among these demographics variables, i.e., marital status and employment status were measured on the dichotomous scale. Employee perceptions about organizational justice were measured with three its dimensions: distributive justice, procedural justice and interactional justice on 5 point likert scale ranging over 1 (strongly disagree) to 5 (strongly agree). To measure the employee perceptions about organizational justice, scale proposed by (Niehoff and Moorman, 1993) was used. Distributive justice was measured by five items; Sample item intended to measure the employee perceptions of distributive justice was: "I feel that my job responsibilities are fair." The Cronbach’s alpha of items was found to be 0.68. Procedural justice was measured with six items; Sample items intended to measure employee perceptions of procedural justice were: "Job's decisions are made by the general manager in an unbiased manner." The Cronbach’s alpha of items was found to be 0.84. Interactional justice was measured with nine items. Sample items intended to measure employee perceptions of interactional justice were: "When decisions are made about my job, the general manager treats me with kindness and consideration" and "My general manager explains very clearly any decision made about my job." The Cronbach’s alpha was found to be 0.91. Overall employee job satisfaction was measured with three items, including one reversed item, on 5 point likert scale ranging from 1 (strongly disagree) to 5 (strongly agree). This scale was adopted from the Job Diagnostic Survey (Hackman and Oldham, 1975). Examples of the item t are: "All in all, I am satisfied with my job" and "In general, I don’t like my job." The Cronbach’s alpha of items was found to be 0.66. Employee's perceptions about alternative employment opportunities were assessed with three items, on 5-point Likert scale. This scale was adopted from (Mowday et al., 1984). Examples of the items are: "There are many jobs available similar to mine" and "I can find another job doing exactly what I am doing now." The Cronbach’s alpha of items was found to be 0.73. To make certain conclusions regarding the hypothesis which were developed based on extensive review of the literature, for the analysis of data following statistical tools were employed descriptive analysis, reliability analysis correlation analysis and multiple regressions. Table 2 presents mean, standard deviations, Cronbach’ alpha and inter correlations of the study variables. Correlation coefficients of variables except demographics variables have moderate positive relationship with each other, whereas some demographics variables also have negative relationship with other study variables. Value of Cronbach’s alpha ranges from 0.68 to 0.91, these are quite sufficient. In last step we enter international justice it caused (ΔR2 = 0.025, p < 0.05). 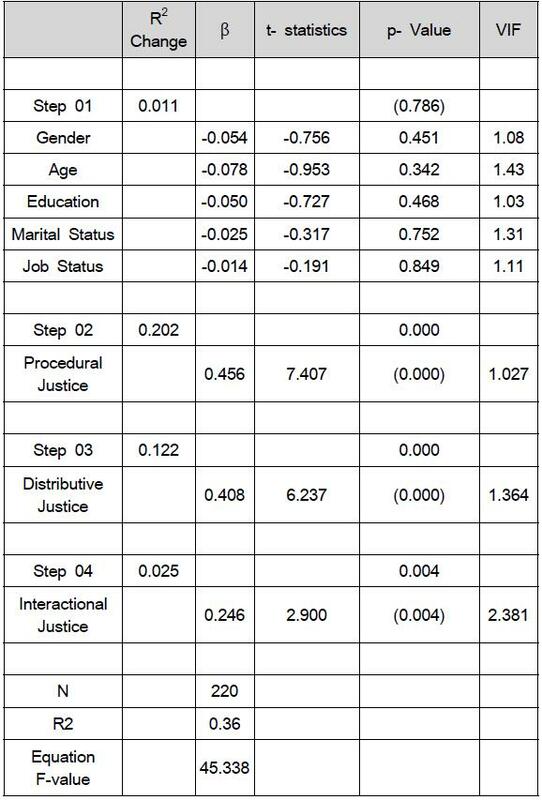 Results are given in table 3. result shows that higher level of procedural justice will brings higher level of job satisfaction, but when we controlled procedural justice, distributive and interactional justice still accounts very significant change in job satisfaction and has not became insignificant after controlling procedural justice. It means distributive justice explains more variance on job satisfaction as compared to variance explained by procedural justice. Additionally to diagnose the problem of multi-collinearity, we test collinearity in table 3values of VIF are given; its values are well below 10.0 it shows there is no collinearity between independent variables. <Table 3> Hierarchical regression results for the influence of control variables and procedural justice followed by distributive justice and interactional justice on job satisfaction. To test first hypothesis that Perceived organizational Justice has a positive impact on job satisfaction hierarchical regression is used. 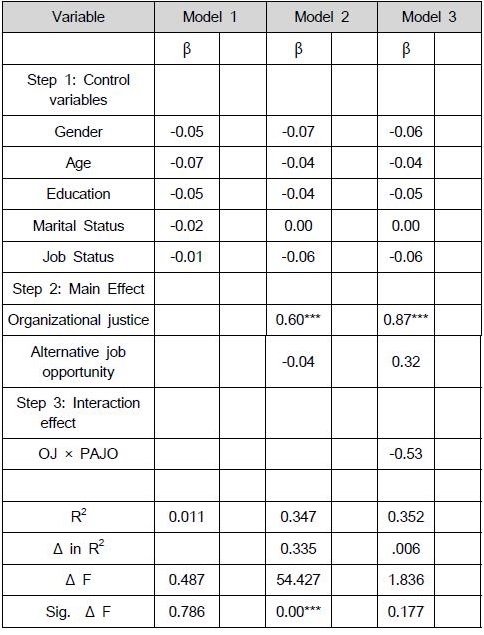 In table 4, the main effect shows that organizational justice has direct and significant effect on job satisfaction (β= 0.60, p< 0.05) hence the hypothesis 1 is supported. Perceived alternative job opportunity was not found significantly related to job satisfaction after controlling the effect of demographics variables and organizational justice. It shows that perceived alternative job opportunity is not an antecedent of job satisfaction; it met the first condition of a moderating variable. <Table 4> Hierarchical regression results for the effects of organizational justice and perceived alternative job opportunity on job satisfaction. H2a stated that perceived alternative job opportunity will moderate the effect of organizational justice on job satisfaction. Table no. 4 (model 3) shows that, there is a significant interaction between organizational justice and perceived alternative job opportunity for employee job satisfaction (β = - 0.53, p <1) that explained variance in the model beyond that due to the main effects (ΔR2 = 0.06, p < 1) so that H 3 is supported. The purpose of this study was to examine the extent to which organizational justices enhance job satisfaction and up to what extent this relationship is moderated by perceived alternative job opportunities. The results of this study are quiet according to expected alternative hypothesis which were developed after conducting extensive literature review. All dimensions of organizational justice have direct and positive impact on employee job satisfaction but all dimensions of justice impact differently on employee job satisfaction. Various previous studies have shown that organizational justice has strong positive impact on employees’ job satisfaction. (Nadiri and Tanova, 2010; Suliman, 2007; Zainalipour et al., 2010). The results of some studies have shown that although all dimensions of organizational justice motivate employees and enhance their job satisfaction but Focus should be given to distributive justice which strongly and positively impact on immediately job environment, such as, job satisfaction and work deviance. When employees will perceive higher degree of distributive justice it will bring positive emotions about his personal job or project will lead to enhance motivation level of employee and will induce employee to work more effectively and efficiently. In our study after controlling the effect of demographic variables, the distributive justice has explained more variance in job satisfaction then procedural and interactional justice. These findings are consistent with the findings of (Nadiri and Tanova, 2010) which showed that the distributive justice has the strongest ability to predict job satisfaction as compare with procedural justice and interactional justice because distributive justice strongly impact on immediate job environment. The inclusion of perceived alternative job opportunity, has made this model very interesting and it provided important implications for enhancing our understanding that why do satisfied customers become unsatisfied even when their organization treat them very fairly. It extended the existing literature on perceive alternative job opportunity and its consequences on job satisfaction. Separate studies were carried out to examine the impact of organizational justice and perceived alternative job opportunities on job satisfaction; in this study we have seen the combined effect of these variables on job satisfaction. The current study has confirmed the impact of both organizational justice and perceives alternative job opportunity on job satisfaction. Organizational justice enhances the employee job satisfaction and perceived alternative job opportunity moderates this relationship. When employees perceived that they are being treated fairly in terms of distributive justice, procedural justice and interactional justice they will become more motivated it will increase their job satisfaction but the distributive justice has explained more variance in job satisfaction. It is interesting to note that when these satisfied customers perceived that there are many alternative job opportunity in the market and they can get a better job if they will left their current job they become dissatisfied with their current job. When some employees perceive that the market is saturated and it is very difficult to seek job opportunity they became more satisfied with their existing job. These finding are consistent with prior studies which found that labor market conditions impact on employee job satisfaction and their turnover intention (Gerhart, 1990). This study is not without limitations and the findings of this study have also open new avenues for number of possible future studies. This study is first, which seek the moderating effect of perceived alternative job opportunities on organizational justice and employee job satisfaction. Survey conducted in baking sector of Pakistan provided support for this moderation. Future research is desirable with other services and non-services sector to further confirm the findings of this study. Expectations and perceptions of people vary across cultures, hence this moderating effect can provide more interesting finding if these relationships will be examined by taking a cross national data. This study was limited in its scope by concentrating on the influence of organizational justice on job satisfaction. Future studies should enlarge the model by including other job-related attitudes like: job commitment, organizational citizenship behaviour and employee intention to leave. 1.Adams, J. S. (1966). Inequity in social exchange. Advances in experimental social psychology, 2, 267-299. 2.Ambrose, M. L. (2002). Contemporary justice research: A new look at familiar questions. Organizational Behavior and Human Decision Processes, 89(1), 803-812. 3.Babin, B. J., and Boles, J. S. (1996). The effects of perceived co-worker involvement and supervisor support on service provider role stress, performance and job satisfaction. Journal of retailing, 72(1), 57-75. 5.Bies, R. J., and Shapiro, D. L. (1987). Interactional fairness judgments: The influence of causal accounts. Social Justice Research, 1 (2), 199-218. 6.Campion, M. A. (1991). Meaning and measurement of turnover: Comparison of alternative measures and recommendations for research. Journal of Applied Psychology, 76(2), 199-212. 7.Cohen-Charash, Y., and Spector, P. E. (2001). The role of justice in organizations: A meta-analysis. Organizational Behavior and Human Decision Processes, 86(2), 278-321. 8.Colquitt, J. A. (2001). On the dimensionality of organizational justice: A construct validation of a measure. Journal of Applied Psychology, 86(3), 386-400. 9.Colquitt, J. A., Conlon, D. E., Wesson, M. J., Porter, C. O. L. H., and Ng, K. Y. (2001). Justice at the millennium: a meta-analytic review of 25 years of organizational justice research. Journal of Applied Psychology, 86(3), 425-445. 10.Cropanzano, R., and Greenberg, J. (1997). Progress in organizational justice: Tunneling through the maze. International review of industrial and organizational psychology, 12, 317-372. 11.Cropanzano, R., Rupp, D. E., Mohler, C. J., and Schminke, M. (2001). Three roads to organizational justice. Personnel and Human Resources Management, 20, 1-113. 12.DeConinck, J. B., and Stilwell, C. D. (2004). Incorporating organizational justice, role states, pay satisfaction and supervisor satisfaction in a model of turnover intentions. Journal of Business Research, 57(3), 225-231. 13.Deutsch, M. (1975). Equity, equality, and need: What determines which value will be used as the basis of distributive justice?. Journal of social issues, 31(3), 137-149. 14.Eisenberger, R., Cummings, J., Armeli, S., and Lynch, P. (1997). Perceived organizational support, discretionary treatment, and job satisfaction. Journal of applied psychology, 82(5), 812-820. 15.Elanain, H. M. A. (2010). Testing the direct and indirect relationship between organizational justice and work outcomes in a non-Western context of the UAE. Journal of Management Development, 29(1), 5-27. 16.Folger, R., and Konovsky, M. A. (1989). Effects of procedural and distributive justice on reactions to pay raise decisions. Academy of management Journal, 32(1), 115-130. 17.Gerhart, B. (1990). Voluntary turnover and alternative job opportunities. Journal of Applied Psychology, 75(5), 467-476. 18.Gilliland, S. W. (1994). Effects of procedural and distributive justice on reactions to a selection system. Journal of Applied Psychology, 79(5), 691-701. 19.Greenberg, J. (1990). Organizational justice: Yesterday, today, and tomorrow. Journal of management, 16(2), 399-432. 20.Griffeth, R. W., and Hom, P. W. (1988). A comparison of different conceptualizations of perceived alternatives in turnover research. Journal of Organizational Behavior, 9(2), 103-111. 21.Hackman, J. R., and Oldham, G. R. (1975). Development of the job diagnostic survey. Journal of applied psychology, 60(2), 159-170. 22.Hulin, C. L., Roznowski, M., and Hachiya, D. (1985). Alternative opportunities and withdrawal decisions: Empirical and theoretical discrepancies and an integration. Psychological Bulletin, 97(2), 233 -250. 23.Irving, P. G., Coleman, D. F., and Bobocel, D. R. (2005). The Moderating Effect of Negative Affectivity in the Procedural Justice-Job Satisfaction Relation. Canadian Journal of Behavioural Science, 37(1), 20-32. 24.James, K. (1993). The social context of organizational justice: Cultural, intergroup, and structural effects on justice behaviors and perceptions. In R. Cropanzano (Ed. ), Justice in the workplace (pp. 21-50). Hillsdale, N.J.: Erlbaum. 25.Judge, T. A., and Colquitt, J. A. (2004). Organizational justice and stress: the mediating role of work-family conflict. Journal of Applied Psychology, 89(3), 395-404. 26.Kernan, M. C., and Hanges, P. J. (2002). Survivor reactions to reorganization: Antecedents and consequences of procedural, interpersonal, and informational justice. Journal of Applied Psychology, 87(5), 916-928. 27.Laker, D. R. (2011). Job search, perceptions of alternative employment and turnover. Journal of Applied Business Research, 7(1), 6-15. 28.Leventhal, G. S. (1976). What should be done with equity theory? New approaches to the study of fairness in social relationships. New York: Plenum. 29.Liljegren, M., and Ekberg, K. (2009). The associations between perceived distributive, procedural, and interactional organizational justice, self-rated health and burnout. Work: A Journal of Prevention, Assessment and Rehabilitation, Vol. 33 No.1, pp. 43-51. 30.Lind, E.A., and Tyler, T.R. (1988). Social Psychology of Procedural Justice, New York: Plenum Press. 31.Locke, E. A. (1969). What is job satisfaction?. Organizational behavior and human performance, 4(4), 309-336. 32.Martin, C. L., and Bennett, N. (1996). The role of justice judgments in explaining the relationship between job satisfaction and organizational commitment. Group & Organization Management, 21(1), 84-104. 33.McFarlin, D. B., and Sweeney, P. D. (1992). Distributive and procedural justice as predictors of satisfaction with personal and organizational outcomes. Academy of management Journal, 626-637. 34.Mobley, W. H. (1977). Intermediate linkages in the relationship between job satisfaction and employee turnover. Journal of Applied Psychology, 62(2), 237. 35.Moorman, R. H. (1991). Relationship between organizational justice and organizational citizenship behaviors: do fairness perceptions influence employee citizenship?. Journal of Applied Psychology, 76(6), 845. 36.Mowday, R. T., Koberg, C. S., and McArthur, A. W. (1984). The psychology of the withdrawal process: A cross-validational test of Mobley's intermediate linkages model of turnover in two samples. Academy of management Journal, 79-94. 37.Nadiri, H., and Tanova, C. (2010). An investigation of the role of justice in turnover intentions, job satisfaction, and organizational citizenship behavior in hospitality industry. International Journal of Hospitality Management, 29(1), 33-41. 38.Niehoff, B. P., and Moorman, R. H. (1993). Justice as a mediator of the relationship between methods of monitoring and organizational citizenship behaviour. Academy of Management journal, 527-556. 39.Price, J. L. (1977). The study of turnover. IA. : Iowa State University Press Ames. 40.Price, J. L. (2001). Reflections on the determinants of voluntary turnover. International Journal of Manpower, 22(7), 600-624. 41.Suliman, A. M. T. (2007). Links between justice, satisfaction and performance in the workplace: a survey in the UAE and Arabic context. Journal of Management Development, 26(4), 294-311. 42.Sweeney, P. D., and McFarlin, D. B. (1993). Workers' evaluations of the" ends" and the" means": An examination of four models of distributive and procedural justice. Organizational Behavior and Human Decision Processes, 55, 23–40. 43.Syptak, J. M., Marsland, D. W., and Ulmer, D. (1999). Job satisfaction: Putting theory into practice. Family Practice Management, 6, 26-31. 44.Tang, T. L. P., and Sarsfield-Baldwin, L. J. (1996). Distributive and procedural justice as related to satisfaction and commitment. SAM Advanced Management Journal, 61, 25-31. 45.Trevi-o, L. K., and Weaver, G. R. (2001). Organizational justice and ethics program" follow-through": influences on employees' harmful and helpful behaviour. Business Ethics Quarterly, 11(4), 651-671. 46.Vallen, G. K. (1993). Organizational climate and burnout. The Cornell Hotel and Restaurant Administration Quarterly, 34(1), 54-59. 47.Weiss, H. M., Suckow, K., and Cropanzano, R. (1999). Effects of justice conditions on discrete emotions. Journal of Applied Psychology, 84(5), 786. 48.Zainalipour, H., Fini, A. A. S., and Mirkamali, S. M. (2010). A study of relationship between organizational justice and job satisfaction among teachers in Bandar Abbas middle school. Procedia-Social and Behavioral Sciences, 5, 1986-1990.